It may be true that David Hannum was the first to observe that “There’s a sucker born every minute” (ironically, he himself turned out to be a colossal sucker), but it took the marketing genius of P.T. Barnum, the man behind such novelties as the bearded lady to turn gullibility into fortune. The world has changed significantly since the days of Barnum’s traveling freak shows where access to a new audience required lengthy cross country trips. Today, the Internet provides a virtual big top circus ripe with new ways to reel in and deceive, complete with unlimited seating for millions of new victims. Eberhart and Kennedy in their excellent treatise “Swarm Intelligence” suggest that deception is quite common in social populations and they point out that all of us regularly practice it to one degree or another. In support of their argument, they discuss the well documented El Farol algorithm frequently used by individuals to effectively compete in social communities in order to gain material or social advantage. I recently I had occasion to consider this maxim and even try it on for size. A practical and logical individual, I am by no means naive, so I was surprised—even blindsighted!—to discover that a certain financial advisor that I know personally is in fact a grade A shyster. This got me to thinking about the varying shades of dishonesty and gullibility and the gray area that exists between telling “the truth and nothing but the truth” and outright lying especially as it pertains to financial solicitations. You may have noticed that over the last year as the economy has spiraled out of control, the number of mail offers for mortgage refinancing has increased significantly. The banks—which in the past were the traditional providers of such services—are still hemorrhaging profusely from the blunt trauma inflicted on them by the collapse of subprime mortgages. (I certainly don’t get any more solicitations for HELOC.) In what is further proof of the principal of horror vacui, it seems that the legitimate banking mortgage industry has now given way to a new breed of entrepreneurial ventures. These con-corporations have smelled the blood in the water and are aggressively following Mr. Bigweld’s motto: “See a need, fill a need”. Realizing that many of these solicitations were probably rip-offs, I decided to test the waters to see if I could find out who was behind one of them. 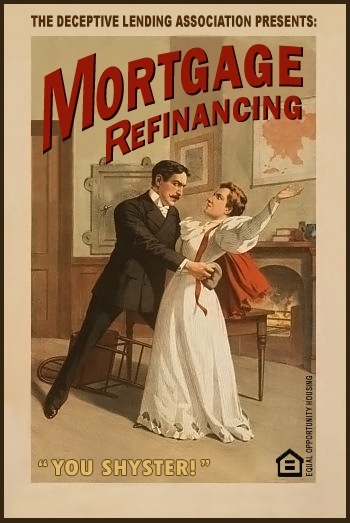 As it happens, I didn’t have to wait long before receiving another mortgage refinancing solicitation letter. This one was from the Intercontinental Capital Group (ICG) and instead of sending it directly to my circular bin, I opened and read. On the surface, the language and content of the letters was drastically different from the one I’m accustomed to receiving from my bank. Whereas previous solicitations were factual and down to business, these were laced with crafty and deceptive language. Disingenuous Claims of Previous Communication—In order to lower suspicions and fake familiarity, the letter claims to be a follow up on an already established relationship and ongoing communication. 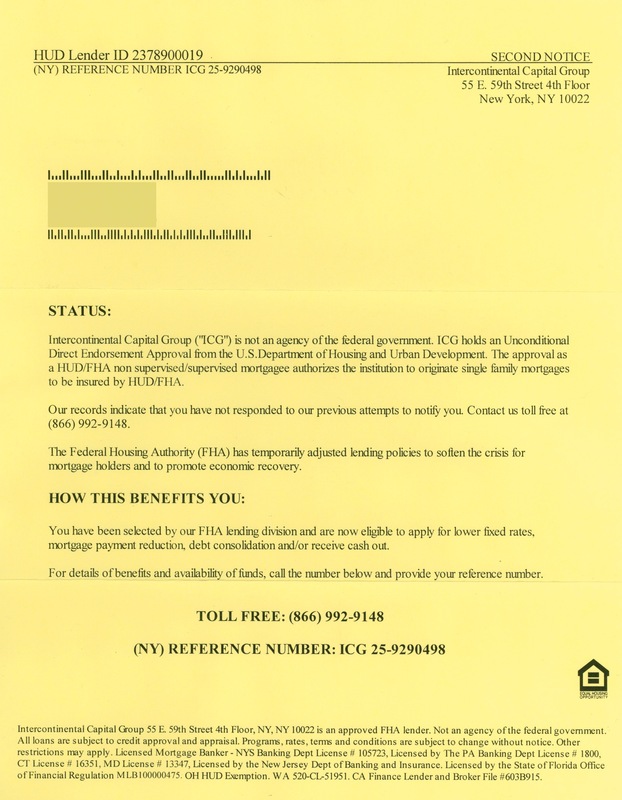 Design to Deceive—The letter contains what on the surface appears to be a legitimate application number, a “second notice” tag, a recognizable equal housing lender logo and acronyms of well known public and federal organizations. In fact none of these details has any significance and are there simply to create the semblance of legitimacy. Vague and Deliberately Confusing Language—The letter states that ICG is “unconditionally endorsed by the U.S Department of Housing and Urban Development”. When I called the toll free number I heard: “Thank you for calling the FHA application processing center”. 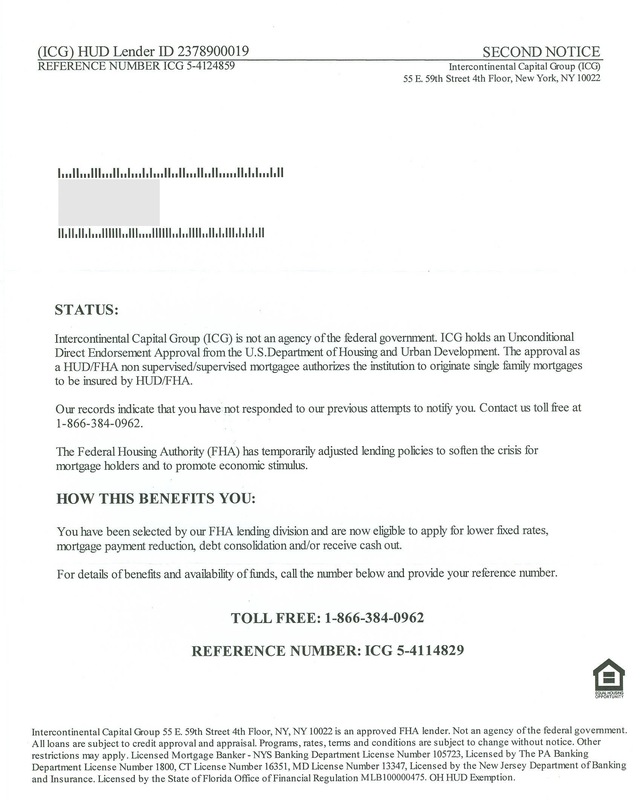 ICG is certainly not a Federal Housing Administration (FHA) application processing center as the FHA neither issues loans directly nor has an application processing center. Skin Deep Corporate Internet Presence—On the surface the company web site appeared to be fully functional, but when I tried to use some of its key functionality (login, change password, etc.) I quickly discovered that none of it worked. Being deceitful in marketing is not news (see Mortgage Refinancing Shysters II for more details), so I take it for granted that any marketing campaign will always be laced with a certain amount of dishonesty, Seth Godin event thinks that All Marketers are Lairs. But “ICG” takes this to a whole new level. This shadowy organization not only stretched their marketing collateral, they actually had some serious run-ins with several state banking regulatory agencies. It appears that the vacuum created by the retreating lending banks is being filled in by old style confidence and run of the mill Internet scam companies. Be mindful of this and remember that “there’s no such thing as free lunch”. If the mortgage refinancing offer you received looks too good to be true, it probably is. © Copyright 2009 Yaacov Apelbaum All Rights Reserved.